This route runs along the foot of Peña Montañesa and crosses limestone from the Paleocene and sea bottom rocks, marlstones and sandstones from the Middle Eocene, with formation intervals aged between 65 and 54.3 million years old and between 49 and 37 million years old respectively. . The first information panel along the route tells us about carbonate rocks; the second one tells us about why the materials of Peña Montañesa were deposited in such a particular way and the third one tells us about why some rocks along this route are completely retracted. 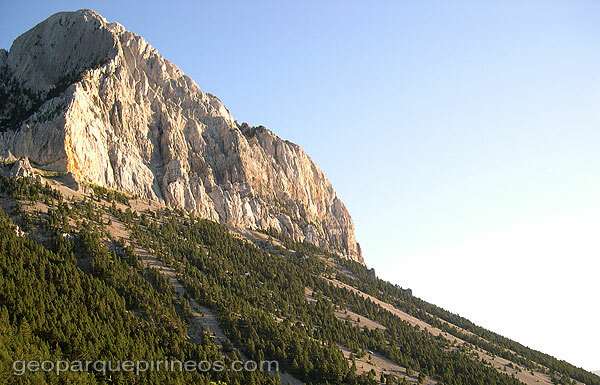 On the route V.10.1, the information panel explains the phenomenon which causes the formation of the slope at the foot of the escarpment of the Peña Montañesa. Route map highlighting the points of geological interest along Route 10. 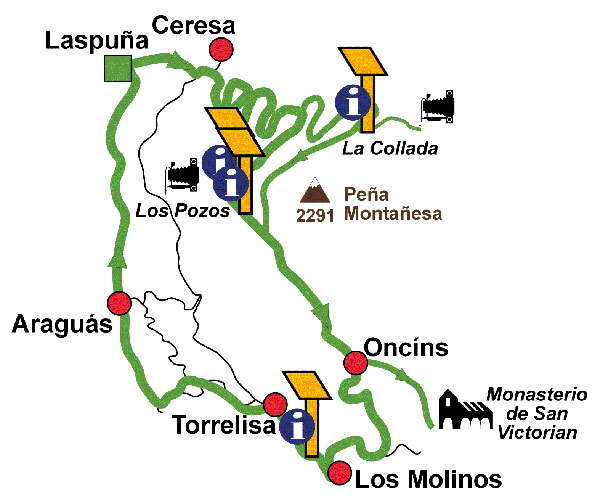 Laspuña-Ceresa-Tozal de los Pozos-Oncíns-Los Molinos-Torrelisa-Araguás-Laspuña.